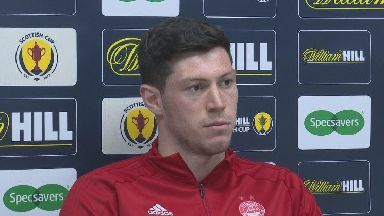 Aberdeen defender Scott McKenna has backed his young teammates to come of age in Sunday's Scottish Cup semi-final. The Dons face Celtic without experienced captain Graeme Shinnie, who will miss the Hampden clash through suspension. But McKenna, 22, believes the likes of Lewis Ferguson, Connor McLennan and Sam Cosgrove will step up to the plate against the champions, who are chasing a triple treble. The Scotland centre-back is confident in his own ability to cope with the added responsibility placed on his shoulders. He said: "He [Shinnie] has played every single game this season and he is a massive player for us and we are gutted he is missing the game, but it's up to us to step up to take on that responsibility. "I don't feel the pressure but you have to take the responsibility - and if I'm going to back myself I need to handle that responsibility. "I do feel a bit older when you have 17, 18 and 19-year-olds coming in, suddenly 22 feels a mile off that. "Obviously it's great to see those boys coming through and it's doing well, and you need to look after them as much as you can when things aren't coming off for them." Aberdeen have knocked Rangers out of both cups this season and ran Celtic close in the League Cup final, eventually succumbing to a 1-0 defeat. McKenna is confident Aberdeen will produce the perfect game plan for Sunday's encounter. He said: "I think we have been at our best in the cup games, able to nick a goal and hold on, that's been massive and I'm hopeful the game will go in our favour. "Anytime you play Celtic they probably are going to have the majority of the ball so you need to be disciplined and we need to be the exact same again. "When we get the chance we need to look after the ball a bit better so we can take the game to them. "When you do have the ball you need to concentrate even more, because they can break on us whereas if we are all in a good shape and narrow and making it harder for them to break us down, it's easier for a defender, but it's massive when we do have the ball to concentrate."